The thing to do for anyone with any credibility – if you are a tourist in Peru, anyway – is to hike to Machu Picchu. The standard, most hyped way to do this is along the so-called Inca Trail, over the course of a few days and nights of modest trekking. Porters and mules are provided, and tents are crowded together on pre approved sites. Even all of that is optional for the outdoors averse, as there are even posh lodges that let you sleep in style, just like the Inca surely did. It’s all very baby-boomer retiree friendly, which is all well and fine. To be honest, my original plan was to sign up for something along this line, as the historical hook on which this million dollar tourist gold mine hangs is that this hike follows an actual Inca route. This whole thing has become so popular with American and European tourists, though, that it’s impossible to get a space on the Inca trail unless you book a year or so in advance, which I wasn’t able to do given the timing of the grant I received for this whole trip. But no matter. That is all prologue. I’m the history teacher, and I’m here to inform you that the Inca actually built roads throughout the entirety of their 775,000 square mile empire. So an alterative to the so-called Inca Trail could be found. Our guide for this journey was Miguel, a thirty-something superhero who seemed to know every single person in this isolated valley. Miguel was charming and energetic, not just with us, but to every child we met on the path as they returned from school. He had bread to offer them – a kind of toll paid, since they were gracious enough to let these crazy foreigners walk their highways for a few days. He stopped to pick up every single piece of trash that he found littering the way, which admittedly, wasn’t much, but the man ended up adding this trash to his own pack for the duration. In this way, and so many more, he revealed his true, infectious passion for this magical place. Miguel was a font of knowledge, and our point of access into Andean culture. He introduced us to so many people along the way, and shared so much of his abundant love for the people and places around him, that I have to admit that I teared up a bit when it was finally time to say goodbye, just after sunrise at Machu Picchu. Joining Miguel was Pedro, our porter and pack-horse wrangler. We would sleep in his yard the first night, and he and his two young boys and lovely wife welcomed us into their home for dinner. Dinner was supplied by our cook, whose name has slipped my mind at this sleep-impaired moment. He was nearly wordless, but his cooking spoke for him… Like his delicious Andean potato soups. 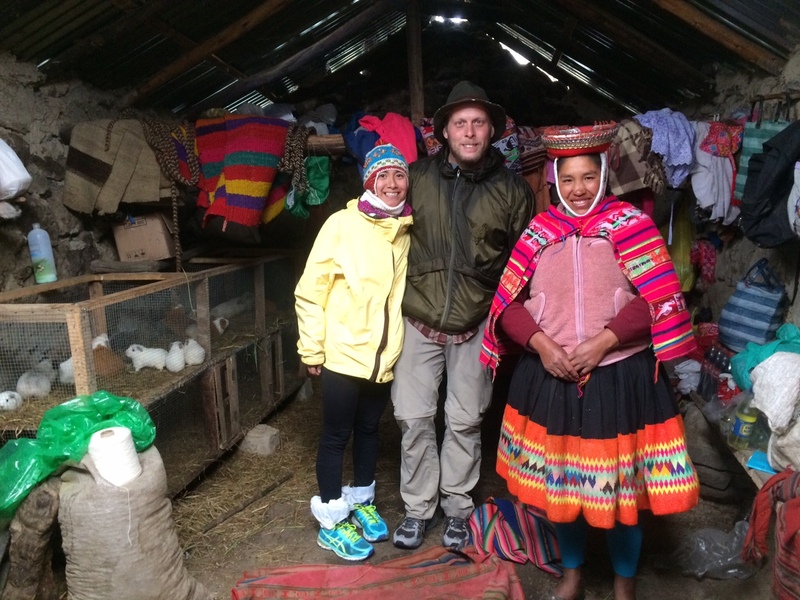 They have hundreds of varieties here, all cultivated at different elevations, under different conditions, offering different nutrition, and providing the basic building block of the traditional Andean diet. The hike started innocently enough with a trip to the local hot springs, which is very nice and serves an interesting mix of hikers and Lares natives who seem to bathe there. It is a luxury place with near free rates for the local, most of whom probably lack hot water if they have running water at all in their homes. Good deal! But after spending a leisurely morning there, a cold rain set in just as we were beginning our hike higher up the valley. We layered up in our rain gear, but Jasmine was still having some difficulty with the altitude. It was slow going on this first day, and we reached Pedro’s house well after dark. That’s about the time the rain stopped. We mutually decided that if we were going to make it over the high pass on day two – some 4,000 meters – Jasmine could use a little help. Pedro, with his ever-present smile, headed out into the near-freezing night and returned around midnight with a borrowed horse. This gracious act was more fortuitious than we could know at the time. This is supposed to be the dry season, when it rains at most once a month. We figured we’d had the worst of it, and that tomorrow would be cold but dry. 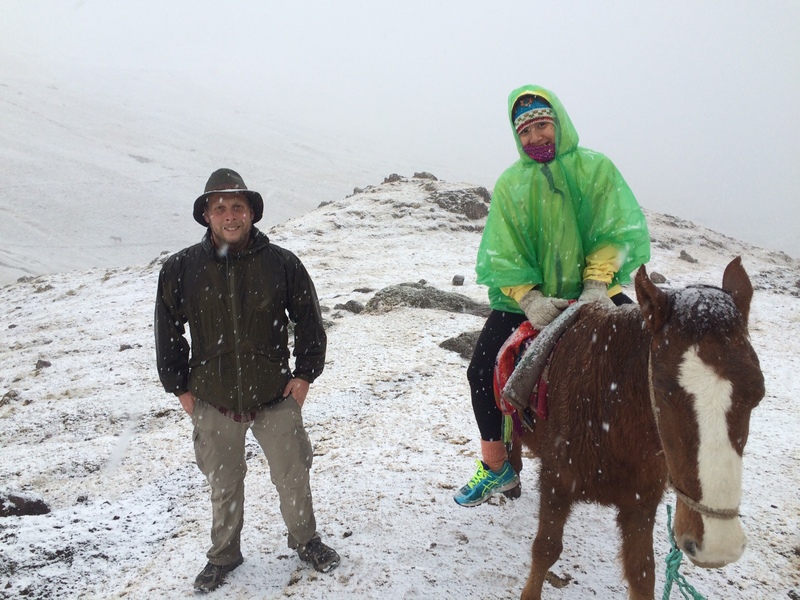 Instead, we ascended from Pedro’s house toward the high pass separating Lares Valley from the Sacred Valley in another steady, chilled drizzle. By midmorning, this had turned to a full on snow storm. I was soaking wet from the rain, but determined to keep moving, for the heat it brought if not for the realization that the snow wasn’t stopping any time soon, and there wasn’t much else to do but go forward. Jasmine was losing feeling in her feet, so we improvised snow boots with a couple of plastic bags to keep her wet socks away from her skin. We’re here moaning about our gym shoes, as Pedro races past us through ankle deep snow wearing nothing but flip flops. A kind family invited us into their one room home to warm ourselves by the fire. This was a pretty big deal, as Jasmine was well on her way to becoming hypothermic. These folks spoke a mix of Spanish and Quechua, the language of the Inca Empire. They shared with us some of their potatoes, which comprised their entire menu this afternoon and most – one variety preserved against winter through a thousands of years old process of freeze drying, and in return we offered the selection of mixed vegetables from our boxed lunches. We set out once more into the snow, which stopped only once we descended to a low enough altitude that it continued as cold rain. We later heard that a number of folks on the Inca Trail turned back under similar conditions, but I’m proud to say that thanks to the generously and support of Miguel, Pedro, our cook, and of the friendly families who hosted us, inviting us in or just letting us pitch a tent near their homes, we made it through what was one of the physically most challenging experiences of either of our lives. But, of course, this was just another day in the middle of the week of their lives, and that is truly remarkable thing to me. That they work so hard for what amounts to so little – by way of their alpacas, their potatoes, selling some goods here and there to tourists like us. That their children literally follow this route five days a week to go to school in the village. Then follow the same route back in the afternoon to come home. That to me, this is one of the hardest days I can ever remember, and to them, it was just another Wednesday. 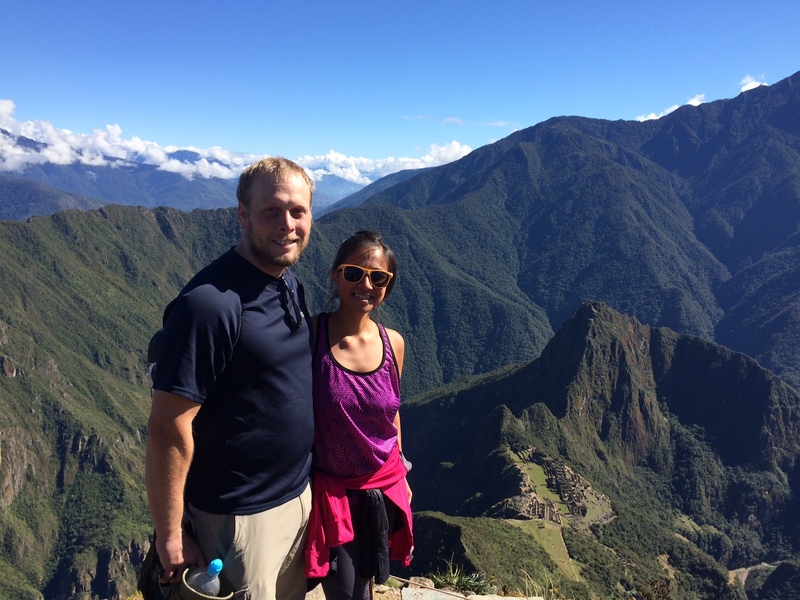 We made it to Machu Picchu, and it was beyond stunning. Really, words don’t do it justice. Miguel insisted that we arrive before dawn, so we did. And it was worth it. The Inca built these mountain top temples for the express purposes of catching the sun’s light, which to them was sacred. Not getting there for sunrise is like going to a restaurant not to eat. And by this time, Jasmine had overcome her altitude sickness to the degree that she managed to climb the peak overlooking the temple – an extra thousand vertical meters. Not only did she climb it, she came back down, too! And did it with a smile. Or at least a grimace. I married a strong woman. Thanks to Miguel, who helped me to see so much that will hopefully work its way into the lessons I intend to write as a part of this whole grant from Fund for Teachers. I hope you’re out there reading this!